It was a beautiful, sunny day — perfect conditions for the launch of a PhoneSat — that's right, a large balloon carrying a smart phone into space. That day, Planet Labs CTO and Co-founder Chris Boshuizen smiled up at the sky, accompanied by Ben Howard, who helped design the craft's structure, and Mike Safyan, who souped up the phone's radio. Together they proved that a phone could indeed act as a satellite — and NASA picked up where they left off. What you may not have guessed is that two of these three aerospace pioneers were interns at the time. Things are very different today. Howard runs the system engineering team, and Safyan is now director of launch and regulatory affairs, navigating the complex web of radio spectrum licenses required to get satellites off the ground. As for Boshuizen, he's all about finding the next crop of brilliant interns and helping them fly. At First Round’s recent CTO Summit, he described how Planet Labs has built its internship program from the ground up to yield extraordinary talent for the company. Here, he shares tips for finding, training and retaining great interns, and the one key lesson that has made the biggest difference. For starters, ditch the notion that there’s a prescribed ratio of interns to full-time employees. If you have meaningful work to do and the time and ability to mentor junior staff, don’t limit yourself. Less important than the number of interns you hire is the culture you create around their position in the company. Interns at Planet Labs do not make coffee. They don’t spend days on inconsequential busywork, or run errands at employees’ whims. There's no time for this between crafting satellites and becoming experts in FCC policies. Boshuizen's secret to a remarkably productive internship program is enlisting interns to work on mission-critical tasks, and then giving them as much trust, freedom, and information as they need to succeed. “When you say, ‘We're going to trust you with the core of the company,’ people are able to perform at the highest level, whether they're an intern or a full-time employee,” Boshuizen says. Planet Labs interns are treated as essential team members so that they have the potential to produce valuable results. If I have one key message, it would be this: immerse interns in the core of what you're doing. Take Alex Wen (pictured above). When Planet Labs was manufacturing its first product, the team faced the herculean task of building 30 satellites on a tight schedule. When some crucial hardware came in late, that schedule got even tighter. “Production got backed up and backed up. We needed to build a team that could help us scale,” Boshuizen says. Undaunted, he returned to the intern pipeline that had already served him so well. “Our technical advisor said this was crazy, and that the satellites should be built by the experts who designed them,” he says. “We chose to ignore all of that advice, and we hired Alex and several other interns to build all of the satellites by themselves. We set up some software to walk them through how to build a satellite, and we gave it to Alex.” He and his team cranked out 26 of those first 30 units — and put any further intern nay-saying to bed. This model treats interns like insiders — and they enjoy access to all the information that comes with that status. From all-hands meetings to company off-sites, Planet Labs’ interns go where the team goes; when they’re working on a product, they know what the team knows. This begs the question: How do you find people you're willing to put this much faith in? How do you find people capable of what Ben, Mike and Alex made possible? 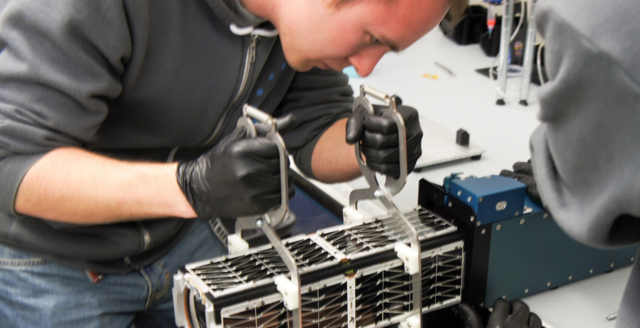 Ben Howard at work on one of Planet's Dove satellites. Like hiring of any kind, intern recruiting is an expensive and time-intensive process. It can't be an afterthought. You need to give it plenty of attention if you want your program to pay off. Last year, one of Planet Labs’ lead engineers managed intern recruiting, and Boshuizen estimates it took two-thirds of her time for about three months. This year they’re bringing two dedicated people on board to run the process. To really do internships at scale, it takes a lot of high-touch labor. When it’s time to start hiring interns, Boshuizen recommends making diversity a top priority. From its headquarters in San Francisco, Planet Labs certainly recruits heavily from Stanford and Berkeley — but they also make it a point to look around the country for the widest and strongest pool of available talent. Career fairs can be particularly valuable. Boshuizen estimates he gets 300 to 400 resumes at each one. But before you head out on a tour of universities, spend some time crafting your value proposition and making it come alive. You want to build a booth that looks and feel different than what everyone else will have, and think of ways you can draw prospective interns to your product. The Planet Labs team, for example, brings a model of their 'Dove' satellite. “Seeing the actual hardware there really excites people when they come around,” Boshuizen says. You know that you’re working on game-changing solutions — the trick now is to convince bright new talent that they can and will have a meaningful role in that work as well. You want to come armed with tons of examples and compelling stories about what past interns have had the chance to do and what they've been able to build. This is your best weapon for standing out. If you can bring some visuals of what work and life is like during the program — showing off how hands-on interns get to be — that's even better. Add one more filtering mechanism by requiring candidates to submit their resumes online after they've met with you in person at a career fair. You’ll have fewer to review and, as an added benefit, you'll get a more coherent statement of interest from your candidates. You'll also get a clearer signal through the noise by only considering the people who were willing to take the extra step to get on your radar. Finally, stay open to interns who come to you through unexpected channels. Remember Ben, Planet Labs’ head of engineering? When Boshuizen met him, he was actually a film intern for Silicon Valley’s Singularity University, handling its recorded lectures. It turned out his degree was in mechanical engineering and he wanted to put that to use. Now with 75 satellite launches to his name — more than almost anyone else on Earth — he's been a huge find for Planet Labs, and proof that it's important to interact with and have meaningful conversations with as many people as you can, even if they don't fit a pre-set profile. So, you sold an exciting opportunity during the recruiting phase — now it’s time to make good on that promise. If you have the resources and a robust program, it’s absolutely 100% worth hiring an internship coordinator. If that’s not in the cards, you can certainly make do without one. Just remember that the happiest and highest-performing interns are the ones who have a positive, thoughtful experience — and creating that experience depends heavily on them having one, tremendously influential and organized person to look to. More on that later. DO: Provision interns appropriately. Here, too, you need to take care of your new team members, however long they’re expected to be with you. That means they need to have, at a minimum, a fresh laptop and a clean, spacious place to work, along with whatever other tools and software they need to be successful at their daily responsibilities. DO: Welcome unexpected culture shifts. If you hire interns in batches — say, a class of summer interns — your office culture is likely to benefit from their shared experience. You can’t plan for it, but when it’s nurtured, that camaraderie will help shape your company’s culture far beyond one summer. For Planet Labs, the mark interns have left is on display every Tuesday — Tutu Tuesday, that is, the brainchild of last summer’s class. Most of those interns are now gone, but everyone in the company still has their tutus (and puts them to use!). DON’T: Drop your end of the bargain. Give it time and energy, and your intern program could be your secret weapon for scaling quickly, or for tackling one-off projects that will supercharge product development. In exchange, you owe interns the guidance that attracted them to the opportunity. Before they even set foot in the office, make sure your mentorship structure is clearly outlined, and that full-time team members understand your expectations. A common failure mode I've seen is when the mentor or the supervisor for an intern is chronically unavailable Interns suffer as a result. Whether verbalized or not, there will always be one question hanging in the air over every intern you employ: "When this is over, will you have a job for me?" Boshuizen’s interns have run the gamut, from undergrads in-semester to grad students completing their master’s projects at Planet Labs, from recent grads to more seasoned professionals working in a contract-to-hire capacity. But it’s ultimately the latter category that inspired the company’s intern hiring philosophy. “I'd say the intern programs that we've been running are more like contract to hires for everybody,” Boshuizen says. An internship is the best possible technical interview that you can have. Afterward, you'll know for sure whether you want to work with that person again. If interns do “pass” their internship-as-technical-interview, though, keep them moving through a modified hiring funnel. “We do a lightweight final internship interview — really it's just the founder interview to make sure they're a cultural fit, and then a team leader interview to actually see if there's a role,” Boshuizen says. Hiring an intern should look a lot like hiring any other candidate. Create a job description and make sure that the role is accounted for in your staffing and financial plans. “It's very important that you actually have a real job when you bring somebody in like this,” Boshuizen says. Not only does your new hire need and deserve that clarity, it’s important for your organization’s overall morale that you not appear to hire people simply because you think they’re fun. But at the end of the day, whether an intern is hired or not — whether they’re with your company for three months or three decades — you have an opportunity to give your industry’s burgeoning talent a one-of-a-kind education. Planet Labs interns leave their experience with a pretty great snapshot of their own: An image taken from space thanks to something they’ve built. When you put this level of thought and care into your program, your chances of hiring the best are vastly increased, and even those who don't get a spot will walk away as fans wishing they had.